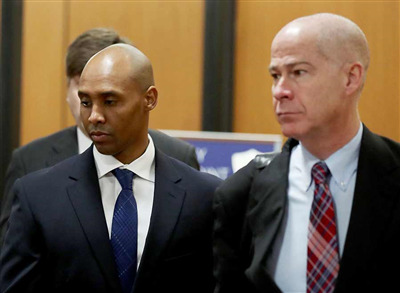 Mohamed Noor, who shot and killed Justine Ruszczyk Damond as she approached his squad car after calling 911, was reacting to a loud noise and feared an ambush, his attorney said Tuesday, calling the shooting "a perfect storm with tragic consequences." Noor and his partner were rolling down a dark alley in response to a call from Damond, a dual citizen of the U.S. and Australia, who contacted police about a possible sexual assault. That's when a bicyclist appeared in front of them and they heard "a bang," defense attorney Peter Wold said in his opening statement at Noor's trial on murder and manslaughter charges. Prosecutor Patrick Lofton, in his opening remarks, questioned a statement from Noor's partner, Matthew Harrity, that he heard a thump right before the shooting. Lofton said Harrity never said anything at the scene about such a noise, instead mentioning it for the first time some days later in an interview with investigators. Damond called 911 twice that night, then called her fiance and hung up when police arrived, Lofton said. One minute and 19 seconds later, she was holding her wounded abdomen and saying, "I'm dying," Lofton added. Damond's fiance, Don Damond, was the first witness for prosecutors. Damond sobbed as he described calls from investigators the night of Justine's death, saying he wasn't told an officer had shot her until a second phone call. He said calling Justine's father in Australia was "painful, and traumatic, and the worst phone call I've ever had to make in my life." Members of Justine's family from Australia, including her father, stepmother, brother and sister-in-law, were in the courtroom Tuesday. Her father cried during portions of Damond's testimony. Earlier Tuesday, Hennepin County District Judge Kathryn Quaintance relented on restrictions that would have prevented the public and media from viewing video evidence introduced in the case. That's expected to include body camera video that shows efforts to save Damond. Quaintance had cited a desire to protect Damond's privacy, but a coalition of media groups including The Associated Press had challenged the ban.